Bourton-on-the-Water is a large and quaint village that can be found in the South West region of the shire country Gloucestershire in England. It was nicknamed “Venice of Cotswold” being spanned by a number of small yet very elegant 18th century bridges which is also a very famous tourist attraction to both local and international travelers. Bourton-on-the-Water has a rich history and the many buildings, cottages, and houses themselves are a testament of that. These buildings use Cotswold stone bricks and some them even date back to 400 years old during Elizabethan times. With its rich culture and history Bourton-on-the-Water has many tourist attractions you can go see and experience. One of the main attractions of Bourton-on-the-Water is the Cotswold motoring museum which houses a large collection of vehicles such as motorcycles, vans, and cars from the 20th century. The museum is truly an amazing place to visit especially for motoring enthusiasts. Birdland is a bird zoo where you can see different kinds of birds such as flamingos and penguins and is a must see for any family travelling together. The great thing about this zoo is that you touch and even play with some of the birds. Bourton-on-the-Water also has some specialty shops where you can buy unique and also antique items as souvenirs. And did you know that every 4th Sunday of the month people gather to the farmers market to buy the freshest, locally grown ingredients you’ll ever find such as vegetables, meat and their by products like eggs and milk. Of course what is a vacation without food, Bourton-on-the-Water has various restaurants and hotels that offer various meals to whet your appetite, from home cooked meals in bed and breakfast inns to luxury hotels that offer food that matches up to 5-star restaurants in any city. Bourton-on-the-Water isn’t just a tourist destination; it’s also a great place to live in with friendly locals, fresh air, and great events and occasions to look forward to. 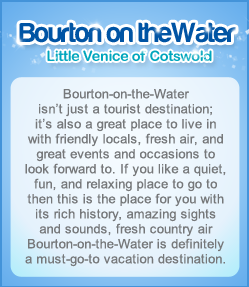 If you like a quiet, fun, and relaxing place to go to then this is the place for you with its rich history, amazing sights and sounds, fresh country air Bourton-on-the-Water is definitely a must-go-to vacation destination.